One of the questions we always ask small and medium sized businesses is “What is your budget for outsourcing your IT?” We typically get an answer to this question less than 5% of the time because the average small to medium sized company has no idea what they should be paying to outsource their IT. They just know that whatever they are doing now isn’t working for them. Worse, because IT is a completely unregulated industry, there is no “standard” way of doing things and there is no mandate that a computer services company provides you with everything that any small office truly needs such as data backup and basic cyber security solutions. 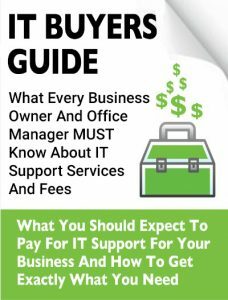 For an in-depth look at how much it costs to outsource your IT check out our FREE Guide – The Definitive Guide To IT Support Services And What To Pay For Them. This helpful free guide will help you to understand the primary 3 methods IT Service companies utilize to bill their clients and how to determine which method is right for you. One warning sign we like to educate business owners and office managers about is to beware of an IT company that would consider walking into your network to fix a problem without a thorough analysis of the entire system. This method of break / fix repair work or hourly repair work is extremely risky because computers on a business network are just one piece of a larger system. Small changes to one program or computer may affect other computers, the server, or even potentially bring the whole network down with just simple setting changes. Any IT Services company that has significant experience will be much more interested in a long term relationship with a quality client where the are capable of providing ongoing services that will stop the computer network from breaking in the first place and have tools in place to be able to quickly react and solve problems to keep you happy. The great thing about outsourcing IT is that it is truly one of the outsourced services, like a good CPA, that will grow with you and provide more and more benefit over time the longer you work together. Here is an example of how we were able to help a growing construction company break through a growth barrier and accomplish operational and profit objectives that they had spent years trying to figure out. Lasa Construction came to On Call in need of a total package solution. They needed someone who could fix their computers on demand, but more importantly solve some business level issues that the old break / fix hourly IT guy just didn’t really care much about. With a good relationship in hand it was a tough decision but management knew they needed a higher level of help as their current IT guy just wasn’t able to get a good plan in place for office employees to collaborate, share data, and move their software package to an SQL capable server. After receiving some of our marketing Lasa decided to call On Call and we put our heads together throughout a deep discovery process in order to truly understand their needs. They had a growing employee base, a need to operate remotely, and a real need for security. Worst of all, during the discovery process On Call discovered that there was no functional backup on their server and that it was actually failing! On Call quickly came up with a plan and went to work. Rather than replace the on-premise server On Call setup a dedicated cloud server with 24/7/365 monitoring and maintenance to by-pass the need for Lasa to maintain it’s own equipment and create a cost effective way to scale up over the long term. On Call was able to provide cost effective backup and cyber security solutions as well and gave Lasa access to it’s award winning help desk and network operations center. Best of all, Lasa achieves the ideal scenario of only paying for the resources they use and not paying for any resources they don’t. Truly a win-win! Not all IT Service providers are created equally. If you would like to learn more about how our industry prices it’s products, check out our free guide – The Definitive Guide To IT Support Services And What To Pay For Them by clicking here.